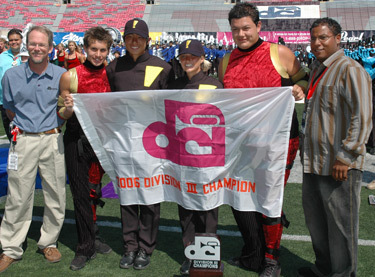 Impulse Drum & Bugle Corps of El Monte, Calif., took the gold medal in Division III competition at the 2006 DCI World Championships presented by A.J.Wright today. First-year corps director Ike Jackson praised the members of his corps and gave them credit for the win. "It's been an uphill battle, and the kids did a great job. The main thing that got us here was the kids' determination and drive. It was well worth it." Drum Major Risa Barillas also gave credit for the win to the members of the corps she led. "The corps is built of the most amazing people I've ever met," she said. "With the hard work they put out, running around the field and getting back to where they're going, and doing everything they do, we couldn't possibly represent all they do every day." The corps took top honors in their division and 8th place overall in the Division II & III Finals. In addition the corps was awarded the Division III Best General Effect, Best Color Guard and Best Percussion. The corps was also awarded with the Spirit of Disney Award in Division III. Jackson said receiving the Spirit of Disney Award was an added honor. "Disney is a very large thing in the sense of what it represents to everyone out there," he said. "I'm just happy that we're a part of that whole legacy of Disney and what they put out there for the audience to experience.